• Client abducts arm to 90°, flexes the elbows to 90°, and rest their dorsal hands on the table. • Client tucks chin, and then lifts head off the table. Weakness of Anterior Neck Flexors if Client is unable to keep the neck in flexion against gravity or the therapist’s pressure. 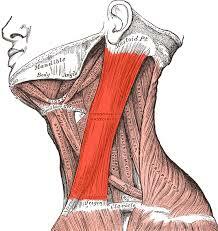 To asses the strength of the Anterolateral Neck Flexors ( SCM and scalene on one side). • Client rotates the head away from the side being tested. Therapist stabilizes the side being tested. • Client lifts the head into slight flexion and hold it against gravity. • Client keeps the head lifted off the table (Grade 3). • Therapist holds the temporal region on the side being tested. • Therapist pushes in an oblique posterolateral direction, away from the tested side. weakness of the Anterolateral Neck Flexors if the client is unable to keep the neck in flexion against gravity or the therapist’s pressure. • Client is seated. Client’s head is in neutral. Therapist stands behind client. • Carefully apply compression downward on the head of the client. Radiating pain or other neurological signs in the same side arm ( nerve root) and/ or pain local to the neck or shoulder ( facet joint irritation). • Client is supine or seated. Client’s head is in a neutral position at all times throughout the procedure. • Therapist grasps the client’s head at occiput and temporalis. One hand on either side of the head. • Slowly traction the client’s head in a superior direction. Maintain the traction for at least 30 seconds. • Client fully rotates their head away from the side being tested. • Client then fully flexes the head to their chest. Client has limited neck flexion. The cause for the hypomobilty may be tight scalenes. • Client seated. Client keeps their eyes closed. 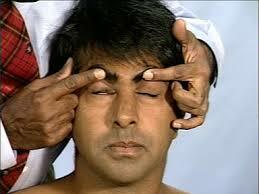 • Therapist tries to slowly open the client’s eye on the affected side with their clean hands. Client cannot keep their eyes closed against therapist’s resistance. • Client extends their neck. Therapist stabilizes the side being tested. • Client then rotates the head towards the side being tested. • Client holds the head in this position. • Client keeps the position against gravity (Grade 3). • Therapist holds temporalis area of the unaffected side, then pushes in an oblique posterolateral direction, away from the tested side. weakness of the Posterolateral Neck Flexors if the client is unable to hold their neck against gravity or the therapist’s pressure. • Maxillary Sinus: Client places the flashlight inside the mouth, against the roof of the mouth. • Frontal Sinus: Using a different clean plastic bag, place flashlight against the medial aspect of the eyebrows. Sinuses are infected or blocked if they do not glow red ( transilluminate). A normal sijus shows a red glow in the area occupied by the sinus. • Client is seated. Therapist stands behind client. • Client slowly extends, sidebends, and rotates the head to the affected side. • Therapist carefully apply compression downward on the head of client. pain may be caused by throat infection, hematoma, bony protruberance of the cervical spine or tumor so client should be advised to see a medical doctor. Client can only get one knuckle or knuckles between their teeth. • Client then rotates the head away the side being tested. • Therapist apply pressure on the posterior head, slightly pushing the head anteriorly and obliquely away from the tested side. 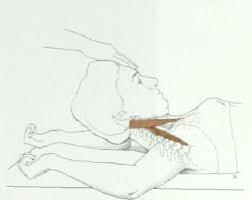 Weakness of the Upper Trapezius if the client is unable to hold their neck against gravity or the therapist’s pressure.